Teenager Aaron Hunter, 16 has returned to Scotland safe and well after his thirty hour kidnapping ordeal. Aaron was taken from outside his home in Clermiston Street at noon on friday in the back of a black 4×4 van, he was released unharmed in the town of Warrington in Cheshire 5pm saturday evening. Aaron was the abducted by armed Glaswegian gangsters, forced into the back of a black 4×4 van and driven 200miles across the border in order to receive a ransom for the boy. He was handed over to Liverpudlians in order to “send a message” to novice Edinbugh dealers who conned English drug barrons with £100, 000 fake cash in a recent heroin scam. 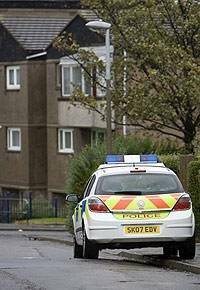 The police also had cars surrounding a house in Saughton Mains and Stevenson Drive in relation to this incident. Police said that the original dealer was also the target of a recent failed shooting and is not the first of attacks made as part of an on going feud between gang members from across the country. The teenagers family managed to persuade kidnappers to postpone their threats to kill Aaron and went into negotiations with detectives without the gangsters knowledge. No money was exchanged in return for the boys safe release.